A landlocked state bordered by four other states is in the heart of the United States. Two-thirds of the land is flat-lands part of the American Great Plains. 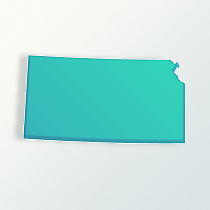 In the eastern third of Kansas are the rolling hills and forest regions. It was Francisco Vásquez de Coronado, the Spanish explorer in 1541, in his quest for the ‘Seven Cities of Gold,’ who was the first European to cross the Kansas lands. Long before Coronado, the Native Indian tribes were nomadic across Kansas, following the buffalo herds. These Plains Indians acquired horses used by Coronado to greatly improve their life in hunting the massive herds. The Kansa tribe occupied the lands from the Kansas River northward. The Osage tribe were from the Arkansas River to the south. From the center of Kansas to the west, the Pawnee Indians dominated the area. It would be the early 1700s that French traders made contact with these Indians and established a few trading settlements. Kansas lands were part of the Louisiana Purchase of 1803 so this event permanently annexed the area to the United States. Only a small section in what is today southwest Kansas was part of the Spanish holdings. By the end of the Mexican War of the 1840s, that too would belong to the United States. People started traveling across Kansas with the opening of the Santa Fe Trail in 1821. Fort Leavenworth was built in 1827 in Kansas was to help protect Americans traveling out west. Two additional trails, the California and Oregon, also passed through Kansas. People were allowed to travel across these plains, but not develop permanent settlements. Since 1821, the Kansas lands were set as Indian territory. To create enough room for the arriving eastern Indians, the native Kansa tribe was resettled in the northeast section and the Osage tribe in the southeast section of the Indian territory. This resettlement of other tribes brought in continued into the 1830s and 1840s. For Kansas genealogy purposes, it is interesting to note, that by 1850 there were many white Americans who wanted to live permanently in Kansas, forcing them to become illegal ‘squatters.” By May 1854, two new territories were created, the Nebraska Territory and Kansas Territory. There was now the push to reduce and move again the many Indian tribes to other reservations, most in the Oklahoma lands. The 1850s also faced the slavery issue and especially whether Kansas would be a ‘free state’ or a ‘slave state.’ Between 1855 and 1858, the Kansas Territory experienced a multitude of violence and some open battles over the slavery issue. This period, became known as “Bleeding Kansas” or “the Border Wars.” The pro-slavery forces won out by 1859 and the fighting ended. Kansas then became the 34th state admitted to the Union on January 29, 1861. During the 1860s there were numerous battles during the American Civil war and then conflicts with the Native Indians that remained. Even the fighting continuing, the railroad westward did go through Kansas. Yet, Kansas, especially the plains region was the true American West with its cattle towns and gunslingers. Slowly, more people came from the eastern states to establish new homes throughout Kansas. In 1860 the population was 107,200 residents. By 1870 that number had jumped to 364,400 and in another ten years was up to 996,000. After the Civil War many freed African-Americans immigrated to Kansas in what is termed the Exoduster period. They continued coming to Kansas through the summer of 1880; then the movement died out. The town of Nicodemus, Kansas is an example of an all-black town settled during this period. Into the 20th century the state’s population steadily increased. In 2009, Kansas has about 2.8 million citizens. For Kansas genealogy purposes, the largest single ethnic group are those of German heritage, making up about 34 percent. Next would be the Irish and English, each at 14 percent. Those of German descent are mostly in the northwest section of Kansas with the English in the eastern portion. In southwest Kansas is a strong Hispanic population which represents about 7 percent of the state’s population. African-Americans make up 6.4 percent of the residents in Kansas. The Protestant religion is well represented in Kansas at 51 percent and Roman Catholics at 29 percent. Agriculture has remained an important economic backbone for Kansas. It is tops in the growing of wheat and sunflowers. Over the years the aerospace industry has grown along with manufacturing plants.